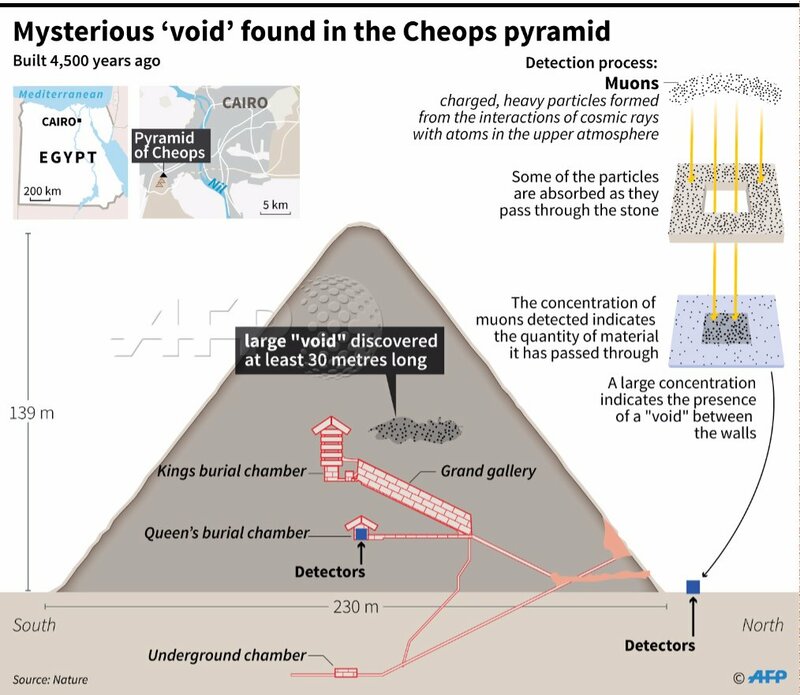 PARIS: A passenger plane-sized “void” has been discovered in the middle of the Great Pyramid of Egypt, where it has lain secret and untouched for 4,500 years, scientists revealed on Thursday. The exact shape and size of the void is fuzzy — its purpose and possible contents a mystery. But it is thought to be at least 30 metres (98 feet) long, and located above the “Grand Gallery” — a sloped corridor almost 50 m long and 9 m high which links Khufu’s burial chamber at the pyramid’s centre to a tunnel leading outside. The monument — 139 metres high today, and 230 metres wide — was erected as a tomb for Khufu, also known as Cheops. To this day, nobody knows quite how it was built. The void, said co-author Kunihiro Morishima from the Nagoya University in Japan, “was not known by anyone until now, from when the pyramid was built 4,500 years ago”. “The big void is completely closed,” he added, which means anything inside it would not have been “touched by anyone after the pyramid (was) built”. The pharaohs of ancient Egypt built these monumental tombs for themselves, complete with sarcophagus to hold their embalmed mummies, and stocked with everything they could require for the afterlife — food, clothing and jewellery. Khufu’s pyramid was plundered long before it was visited by modern archaeologists, and no relics remain from any of the known chambers. For this reason, the new cavity may be “very exciting,” said Morishima, though it is not known if it contains anything at all. The team used a technique called “cosmic-ray muon radiography”, which allowed them to visualise “known and potentially unknown” voids in the pyramid without having to touch a single stone. “We will continue to conduct muon imaging for revealing the detail” of the void, said Morishima — including its dimensions and inclination, and whether it consists of a single, large cavity or a complex of several. The team is already turning its attention to new technology for the next step — possibly a miniature robot that can travel through tiny holes to examine the inside of the void without disturbing anything. The discovery, named simply “Big Void”, has been confirmed using three different muon technologies and three independent analyses, verifying its existence with “high confidence,” the authors said.